Posted by Jonathan Fries on November 11th, 2015 . Sometimes (not all the time) the mousetrap you already know is the better mousetrap. 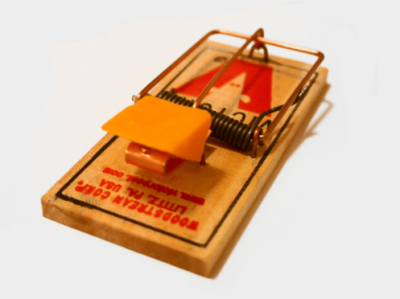 I am, at least for this post, talking about actual mousetraps. I've recently had some run-ins with mice and after trying a couple of newfangled mousetraps I've gone back to the simple, board-and-wire, you-know-it-from-cartoons type mousetrap. The main feature of the new mouse traps seems to be (and you're paying for it): the privilege to not see the mouse you've just killed. You're paying for it in both price (they cost a lot more: 50 cents or less for the old type vs. $5 for the new type), and you're also paying for it in the efficacy of the trap. The old board/wire traps kill mice really well and sometimes they kill mice who weren't even looking for food - put them in the right place and it will kill mice. The newfangled ones require mice to go into the trap, which they can simply decide not to do. Also, a lot of the new ones are 'use once' traps. You know what else is use once? Something that costs 50 cents. But, like I said, you have to see a dead mouse. Just to prove I'm not a total Luddite I did buy some ultrasound blasters that you plug into a wall socket to keep rodents away. I'm waiting to put those up until I see more dead mice though. Some how, just scaring them off with the ultrasound doesn't prove to me their gone.